10. Alfred Edward Mathews (1831-1874). 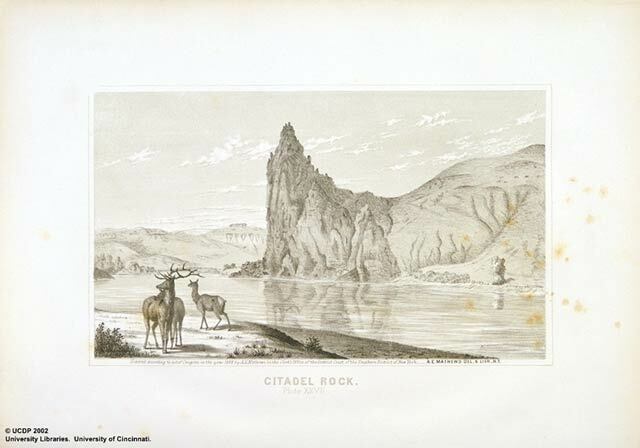 Citadel Rock. Tinted lithograph, Plate 27. Mathews, A.E. Pencil Sketches of Montana. New York: The Author, 1868. Archives & Rare Books Department, University Libraries, University of Cincinnati. "This is the most prominent and one of the most singular of the many curious formations of the upper Missouri. It projects slightly out into the stream. It is of volcanic origin, and contains arglilaceous nodules and quartz crystals. The view is from the opposite bank, looking down."